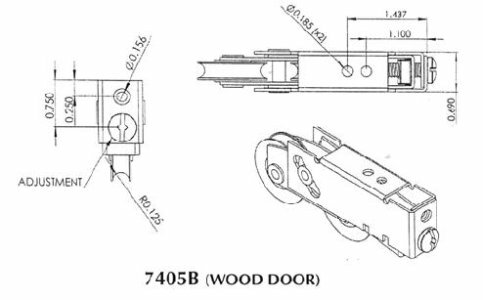 A Bad patio door roller is often the reason when your patio door is hard to open. A patio door roller may have worn out and stopped turning making the door next to impossible to open. It's not the only reason though. The other possibility is that the door is rubbing somewhere. Here's some things to check to find out what is really causing the problem. If the patio slider is rubbing on the bottom sill plate you can usually tell because the sill plate is worn shiny from the constant scraping it. 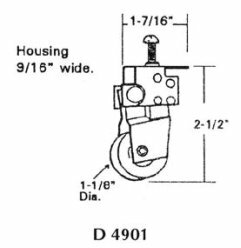 Typically a die cast patio roller housing will break or an axle will wear through and the doorpanel will drop down. Sometimes the rubbing can be fixed by finding the patio roller adjusting screws which raise the roller and tightening them. You will often see a small access hole often near the bottom of the edges of the patio slider. There should be an adjustment screw inside. Do not remove the adjustment screw ! Some patio roller assemblies fall apart when you take the screw out. Then you will have to remove the door and change the roller. 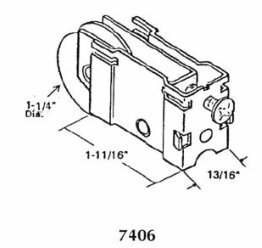 To make it easier to turn the adjusting screw, put a flat blade screwdriver underneath the patio slider and take the weight off the roller by lifting and holding the door up by 1/4 inch. If you cant turn the screw try squirting some penetrating oil on the screw. Let it soak in and then try to loosen the screw again. 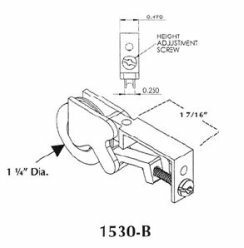 If you still cant turn the screw you will need to remove the bottom of the patio slider and replace the patio door roller. For safeties sake get someone to help you. Some doors are very heavy. Get a friend on the left side of the door and you on the right side. Lift the whole door vertically as far as it will go and try to pull the bottom out over the patio door track. Sometimes the patio door opening has sagged and its hard to get out. I often have to use a long 2x4 and a hydraulic jack to raise the top plate enough to get the door out. To get at the patio door rollers on an aluminum door, there is usually a screw on each side of the door which holds the door bottom on. These screws are usually located just above the hole that conceals the adjustment screws. They are larger than the adjustment screws. Remove these screws and grab the bottom of the door and pull it off the glass. Hopefully it will come off easily, but often it will not. Especially if the door is more than 20 years old. Be very careful if you have to lever it off, the glass can easily get broken. Patience and persistence is the key. Once the bottom is removed, you will see how the patio door rollers are held in. Usually its with a single screw or with bent tabs of metal or a combination of both. Unbend the tabs and remove the screws and take out the roller. Save the screws. They may be special sizes and may need to be reused. As well, have the old screws handy when you pick up the new rollers. Manufacturers sometimes change the length and fastener thread. So test the old fasteners in the new roller to see if you need to buy a different size. You can then take the old patio door roller to a local glass shop to see if they can sell you a replacement, although it is possible the local hardware store may have what you need. Listed below are some of the many different types of roller assemblies and spare parts that are available. These rollers are generally used in patio door sliding panels which one pane or sheet of glass installed in the frame. You would most often find them in a 4 panel patio door, the kind where you have to slide across two seperate panels to get outside. 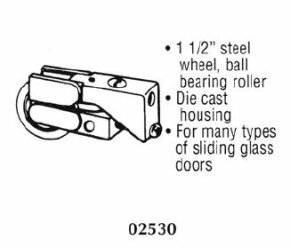 Die cast aluminum rollers are usually found in patio door made in the 1970's onward. They are still used extensively today. I say generally because sometimes these rollers get used in doors which have heavy insulated glass units in them. In those situations these rollers will not last very long, the glass is typically too heavy and will cause the rollers to break frequently. These rollers are made from die cast aluminum / magnesium which is strong but brittle. The small “L” shaped part connected to the adjusting screw is usually what breaks. Other times the bearing seizes up due to rust or wear. These rollers are held in to the patio door usually with screws in the vertical stiles that go into the small hole above the adjusting screw. 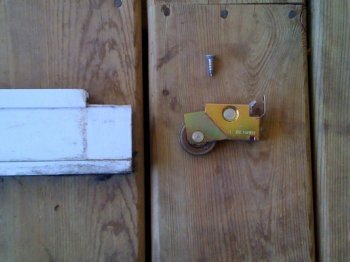 There is a second attaching point that can be used to secure the roller to the bottom rail of the patio door. The screw hole for that is on top just behind the roller. These sliding panels are wider than normal single panel extrusions and have the glass inset of closer to one side than the other. Because of that the rollers were originally made to be right or left handed. 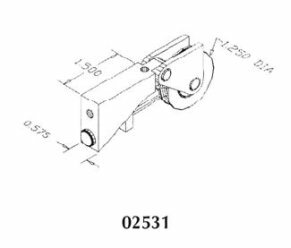 Thats why the 02530C has two mounting holes, one for the left hand mounting and one for the right hand mounting. 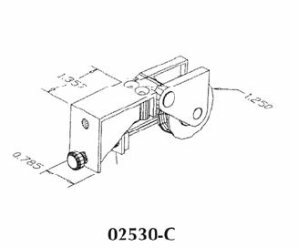 Apart from that its identical to the CD-69 roller which is perhaps the most commonly used insulated glass patio door panel roller. Dont get them mixed up, they are not interchangeable ! These rollers are a little wider to fit into the larger extrusions needed to hold insulated glass units. Insulated glass is very heavy. Sometimes too heavy even for these larger housings. As with the smaller single glaze units, its the L shaped part connecting the adjusting screw to the roller that usually breaks. 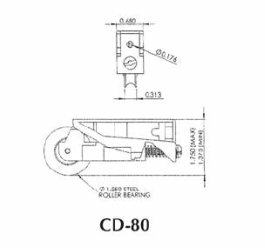 The CD-69 is easily the most popular, the 02530 is almost the same but has a larger diameter bearing or wheel. 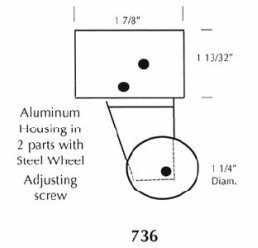 They both have 2 seperate mounting hole locations so they can be mounted using a large diameter sheet metal screw from the vertical stile of with a machine screw through the bottom rial of the patio door. With die cast rollers once they are broken you have to throw out the whole unit, unlike steel housings the bearings or wheels are not able to be replaced. Steel housing rollers are what you will usually find on patio doors made before the 1970's. Unlike the die cast rollers, the steel housings dont break. Thats the reason you will often find older patio doors still working fine after 30 or 40 years. The housing can rust up though and bearings can seize. Sometimes when the bearings seize people continue to force the slider open and closed for years even though you need to pull on it with both hands. 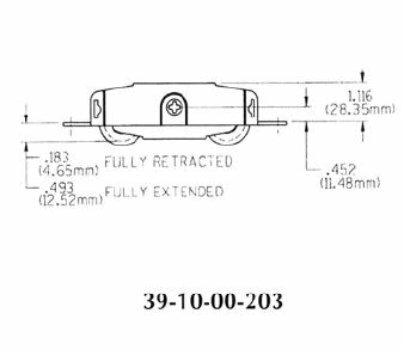 In these situations the axles can grind right through the steel housing. Not good, some of these old housings are impossible to find anymore. Steel housing rollers can be the hardest to get out when you are dealing with an old patio slider. Some rollers like the 02532 are held one using a nut and bolt going through the vertical stile using the hold just above the adjusting screw. The bolt can rust and you may have to drill the bolts head off to get the roller out of the frame. 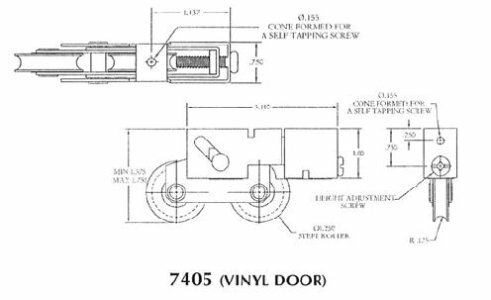 Others like the 7406 use small steel tabs as well as a screw to lock the roller into the aluminum door frame. A considerable amount of gentle prying, swearing and cursing is typically needed to remove one of these. Just finding the tabs is half the battle. 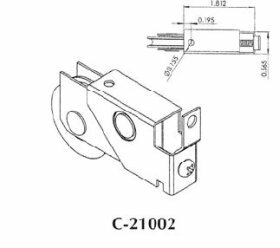 The C21002 is commonly used in modern doors. Its typically used in single glazed door panels but some companies use it in the insulated glass panels as well. It usually ends wearing out quickly when used for these heavier panels. The picture above shows a worn out C21002 roller. The small screw is removed from the bottom rail and roller just slides out the end of the rail. This picture shows a C21002 roller assembly removed from the door bottom rail. This type has the same bearing as shown in the previous picture but here the bearing is riveted in place in a steel housing. This type of housing would be simpler to just replace complete and fortunately its a fairly recent model that is not hard to find. 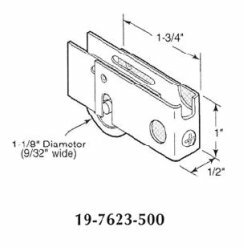 This particular roller assembly is used often on 4 panel sliding doors where each panel holds a single pane of tempered glass. Tandem rollers use 2 wheels or bearings to carry heavier loads. They are more frequently seen in wood patio sliders where the weight of the glass and the wooden frame can be considerable. 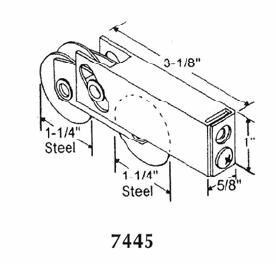 Its a shame they are not used more often, even for regular aluminum patio sliders, because they would run smoother and will last longer than the single wheel versions. When tandem rollers are used in wooden doors its often a lot simpler to adjust the height from a hole in the base rail on the inside of the patio door. 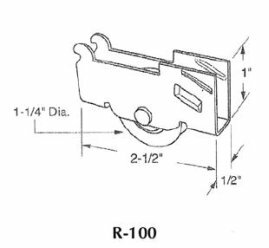 These rollers are also among the easiest to replace because they are simply held into a mortise in the base rail with wood screws. You will still need a helper to lift out the heavy patio slider though to get at them. Special types of roller assemblies. 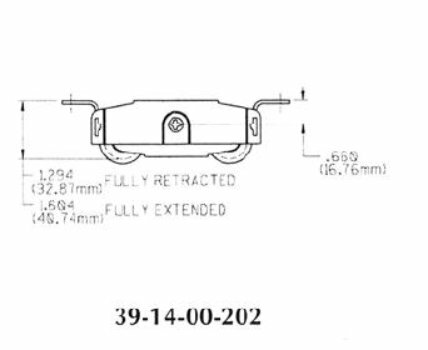 There are some doors that use this roller assembly which contains 2 tandem rollers. When one bearing or wheel is seized you end up having to replace the whole assembly. Mercifully you dont run into these to often. In addition to rollers there are also repair methods that involve snapping in vinyl guides in the bottom of the patio door and a new vinyl track over top of the old damaged track. The process works and you can make your old door glide well without having to remove the door. The only drawback is that you lose the ability to make height adjustments, and if your old patio slider is not square to the jamb because of settlement and shifting the vinyl tracks will not help. Rollers with steel housings are often repairable without having to get rid of the housing. 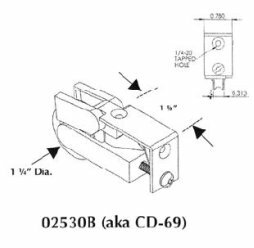 This is helpful when your doors are 30 or 40 years old and there may not be complete roller assemblies still available. Here are some axles used in patio roller bearing replacement. 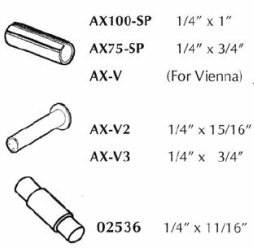 Spring pins such as AX100 and AX75 are available in a lot of big box hardware stores. If you dont get the right size get one that is too long and cut it down with a hacksaw. AX-V2 and 3 are shallow head rivets. Used often with roller bearings. To get the old axles out I use a hammer and a pin punch. Place the roller assembly on top of a small block of steel with the axle line up above a hole in the steel. Then try to drive out the axle with the pin punch. I sometimes use penetrating oil to help loosen the axle before I start trying to drive it out. There are hundreds of different kinds of roller assembly but many of them use similar sizes of wheels or bearings. Even though the whole housing may be long since out of production, you can often replace the bearing and a new axle. Most big box hardware stores have items such as 1/4" diameter spring pins which work very well as patio roller axles. Most times you can buy spring pins the exact diameter and width of the old axle. 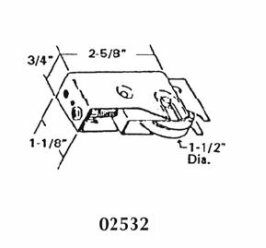 When you cannot get the right length, spring pins can be cut to length with a hacksaw and the pin held tightly in a bench vise. Here are replacement bearings for steel housings. These wheels are used in sliding screens, shower doors and patio sliders. 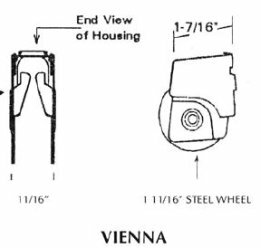 Most patio door bearings are 1-1/4” diameter. Most have all metal wheels although a few types have plastic wheels. Not surprisingly the plastic wheels dont last as well but they do have the advantage that they do not damage the track when they seize up. 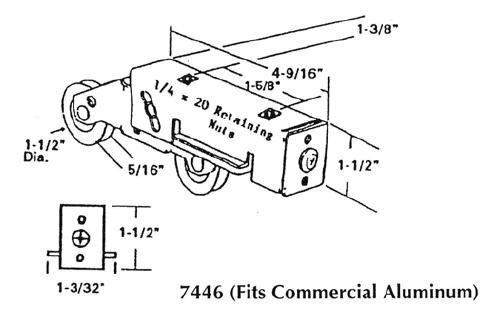 With older doors when a metal bearing has seized up the wheel will often make a divit in the track where the door sits in the closed position. This divit will make the patio slider bump even after new bearings have been installed. Try to fix your seized bearings before things get that bad. A special note about screws. 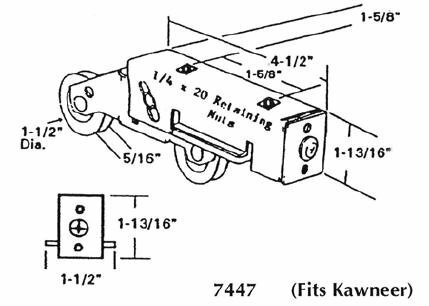 If your patio roller is secured to the bottom rail of the patio doors you will run into a problem if you try to reuse the old screws to attach new rollers. Often the thread changes from the original to the new rollers. Make sure you have screws that fit the new rollers you buy. There are more types of patio rollers than those shown here. The versions shown are just some of the more popular ones.